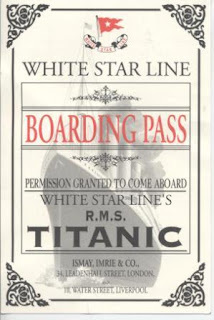 The Titanic Exhibit is in Atlanta (as well as several other cities). We visited the exhibit here in Atlanta at the old Atlanta Civic Center on Saturday and found it quite enjoyable. They've reconstructed several rooms and display a great deal of interesting items - Coins, Currency, China, silverware, pots and pans, jewelry, personal items (bags, hats, shoes), and actual parts of the ship itself (including a piece of the hull, the wheel stand, and the engine room telepgragh). I'd highly recommend it to anyone that is near any of the cities hosting the exhibit (check their website for Cities and locations). We discovered it from an article in the newspaper. I'm suprised there isn't more advertising on tv/radio. For tickets for the Atlanta Exhibit, visit musuemtix or you can buy them at the Civic Center.